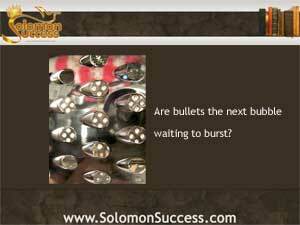 Solomon Success > Blog > Bullets: the Next Bubble About to Burst? Bullets: the Next Bubble About to Burst? King Solomon understood the politics of scarcity. “He that hideth up corn shall be cursed among the people,” he says in Proverbs 11:26, “but a blessing upon the head of them that sell.” Since Solomon’s day, a scarcity of some commodity triggers hoarding and speculation. Fueled by fears about changing policies on gun control, many people are “hiding up” bullets, creating blessings on the heads of some, including ammo manufacturers. According to a recent Forbes post exploring the phenomenon of hoarding ammunition, the perceived scarcity of an item immediately raises the value. For those who recognize what’s going on, it’s possible to cash in handsomely once the bubble peaks. That’s what happened to gold speculators in the early 1970s, when some speculators operating ahead of the curve did very well. But riding the wave of scarcity may or not pay – just ask those who bought the first round of Bitcoins in 2010 or so, only to watch them drop dramatically a couple of years later. That trend is reversing now, with a dramatic upswing n the value of Bit coins as a recognized, self-sustaining digital currency. And, some financial experts point out, these stockpiles of ammunition have the potential to function in a similar way. The threat of a shortage of anything has a profound effect on the human psyche, triggering the urge to grab some before it disappears and hold on to the stores of it that you already have. And the threat of stricter controls on the purchase of firearms and ammunition drives the demand even higher. That’s a tactic equivalent, some say, to the Federal Reserve’s manipulations of the prices of bonds in its purchases of billions of dollars’ worth of mortgage backed securities every month. Unlike other commodities like Bitcoins, bonds or gold, bullets have a limited shelf life and will become valueless over time. In the meantime, though, the demand for ammo has kickstarted a number of manufacturers, which are posting record-setting revenues, and boosted sales in nearly every area of the country—a needed economic boost.